Henry Cavill News: Sunday Bliss With Superman: Hello Henry! We are loving Michaela's big smile! - so happy that she got to meet Henry in Michigan today. And she wasn't the only one who ran into Superman.. I shook his hand and said it was nice to meet him and he said 'it was nice to meet you as well', can't believe I met superman WHAT EVEN?! Lucky girls! 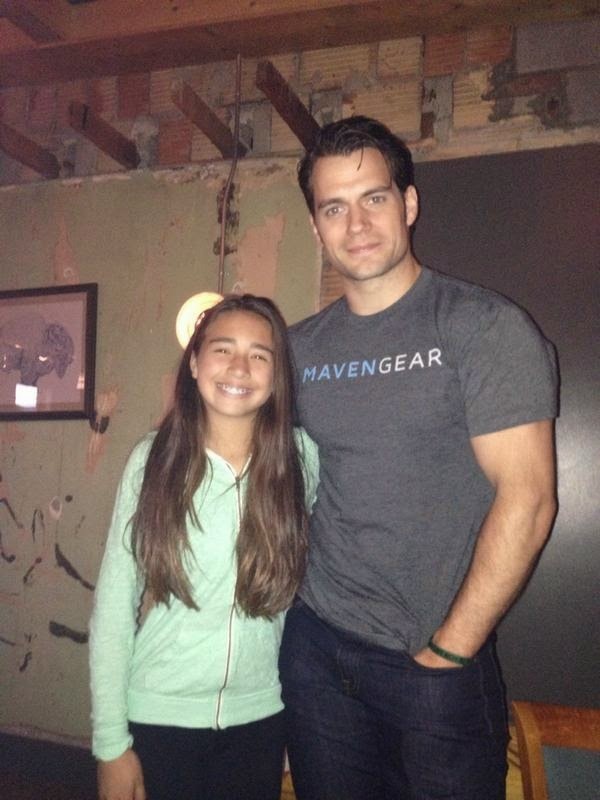 -- Check out our other weekend posts with more new fan pics with Henry: 1/2. P.S. MAJOR t-shirt love. Ugh.. we're gonna miss you summer. He looks like he's about to burst out of his clothes. Hope he gets a strictly Superman sequel. Man of Steel was really good, and I'm not feeling any particular need for more Batman right now. We just had a whole lotta Batman last decade. Bring on Henry/Clark and Amy/Lois! Nothing has been done with Superman since Lois and Clark in the 90s. And all due respect to Chris Reeves, but Henry and this Superman are waaaaaay hotter/more interesting than the old incarnation. I totally agree in hoping that he gets a strictly Superman sequel. Batman, Wonder Woman, etc. take away from the Superman story. Henry already has an extremely handsome face, add to that the perfect body he's rocking and he looks like a God. Way, way perfect. If at the time this movie comes out I am dating or married, it is a done deal that I am going to see it by myself so I can fully enjoy every scene without getting guilt-tripped by a jealous partner. It's going to be all eyes on Henry, because rarely in the history of all the cinema I have watched in my lifetime, has there been a man so perfectly cast that whether watching him on film or seeing him interact with the world, he fully embodies the idea of what a super man is (plus or minus the extra-terrestrial powers). Thank you Zack Snyder for making it happen. Thank you Henry for your hard work...and the work you must do to come across so "super" inside and out. I third that!!! Thanks Zacks for making our fantasy's way way more interesting!!! What smokin' hot dude! !